An excellent day that will stay with me for a long time, but as the title says, one, over the next couple of days at least, I might yet regret. Up at the usual time and after breakfast I packed my rucksack with water, spare towel, sarong, camera, etc. and prepared myself for my day. Have you tried applying factor 50 to your own back; not easy! I then retraced my steps of the previous night. I don’t mean that literally as my steps from last night had been washed away by the tide but I’m quite enjoying this literary thing these days and it sounds better than – I walked round the corner. Ulric met me and kitted me out with the requisites for the day in a tidy net bag, flippers, mask and snorkel and surprisingly on time at 9:00 we carried our gear, plus a large cool box and a couple of chairs, down onto the beach to find the boat just arriving. The Dutch girls were also ready with their net bags of equipment and we were ready for the off. The girls, Jessica and Flo have just finished University in Holland and both now have Masters degrees in Biology, so with my well documented skills it was a very erudite boat-full! 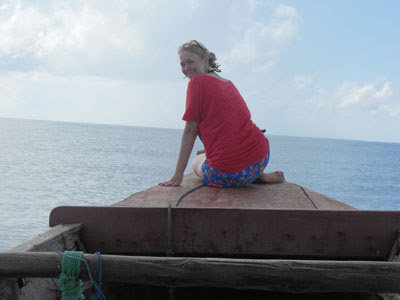 The journey to the island took about 45 minutes until we dropped anchor next to a coral reef just off the shore. The island, as you can see, was simply a sand bank that happened to be above sea level and apart from a few crabs and a couple of terns was devoid of life, either animal or vegetable. The next part of the day is something I can’t really begin to draw for you with words but as I didn't have the luxury of an underwater camera I will try. 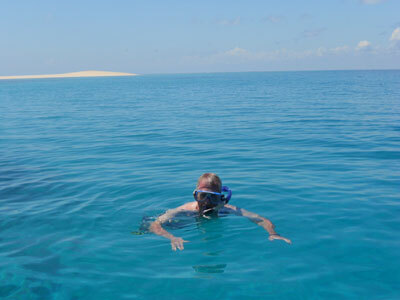 I have snorkelled before but not with gear as good as this and the last time was on our visit to Kenya when the area round the reef was like a marina as it filled up with tourist boats. 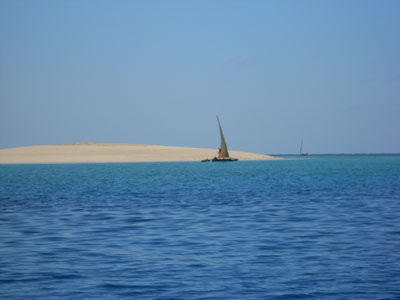 Here there was one boat, ours, plus the very occasional passing Dhow, and in the water only the three of us. The coral was beautiful with a vast array of plant and animal life attached to it. By gliding along on the surface with my mask just under the water I could see the variety of iridescent fish that swam below me and in many places practically on me as the coral came within two or three feet of the surface. 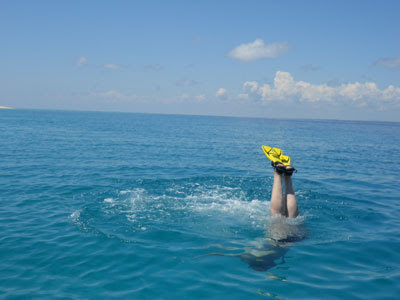 Once I had got used to the breathing routine with the snorkel I did a few dives but without any weights my buoyancy took some overcoming. (fat floats very well) My other problem was that, at the swimming pool, I am used to slowly releasing the air from my lungs as I am underwater, whereas here I needed to save the air to blow the snorkel clear as I surfaced, but after a bit of coughing and spluttering I mastered it. And so to my ‘regret’. You’ve guessed. I realise now I should have taken a T shirt to Tanzania for just such a day as this, but I didn't have one and had decided my polo shirts were a bit too thick so was reliant on the self-applied factor 50. I hope you have finished breakfast because I want you to imagine me floating face downwards in the water. Apart from a languid flick of the flippers to propel me through the water, I am motionless and a few millimetres below the surface of the water is my exposed back. When swimming at Mkoma Bay I have been very vigilant and set a limit of twenty minutes before leaving the water but here with so much to absorb my attention and with the water constantly cooling by back, I overstayed my welcome. 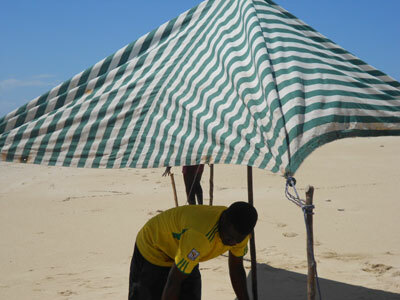 I realised when I re-joined the boat that possibly I had taken a little longer than was sensible so donned a shirt and sarong and for our lunch on the island never really appeared from under the sun shade that was erected for us. More factor 50 and a shorter, more sensible, dive in the afternoon on the other side of the island where, if possible, there was an even greater variety of fish. When we got back on board they had a set of laminated cards with pictures and names of the various species and we were back to ‘I Spy’ as we compared notes on what we had seen. About 1:30 we turned for home and it was interesting to see the landscape that I was getting to know so well, from a totally different angle. I could see the radio masts at Boza clearly and realised the height they were above the sea level that I usually frequented. Eventually we disembarked and after offering up my camera so that relevant pictures could be copied onto Jessica’s laptop, I headed home to the luxury of a cold shower and to once again face the problem of rubbing things onto your own back, this time after-sun. I now must await the morning to find whether my excesses have had a lasting effect or not. I will let you know, but whatever the outcome, I certainly enjoyed the second touristy experience of my stay.